« Do you need an MSP? 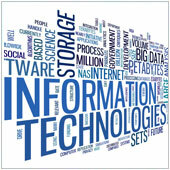 In today’s business environment, technology is an integral part of business operations. The problem many business owners and managers face is that technology can be difficult to manage; often requiring a significant investment and specialized team to maintain and run it. This can be prohibitively expensive too for many small businesses, but it doesn’t have to be, especially if you work with an IT Partner or Managed Service Provider (MSP). This entry was posted in Business, General Articles A and tagged 2014Apr28_BusinessValue_A, QS_3. Bookmark the permalink. Both comments and trackbacks are currently closed.